Byzantine, Texas: This will amuse... some... of you. This will amuse... some... of you. On this cheerful note, a happy Dormition fast to all. Glad for prayer and charity because nasty becomes me per the Commandment "Thou shall not become snarky" around fast time! Grrrrr. Lord, have mercy. Saints become more admirable. Telescope guy: "They're US evangelicals!" 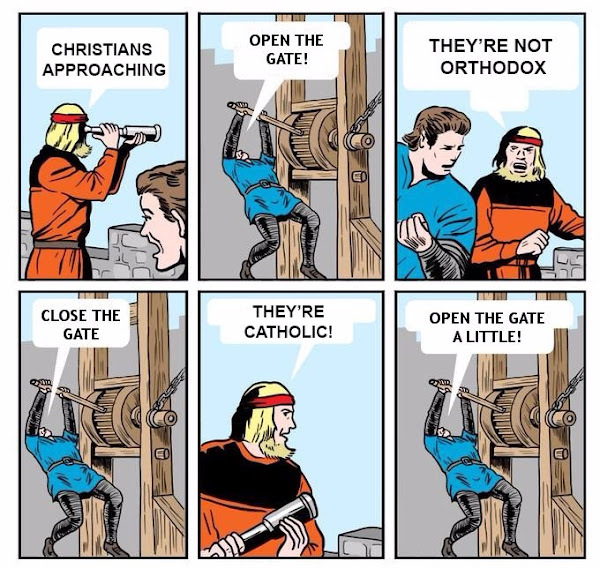 Gate guy: "My old comrades! Praise Jesus brothers, how's your walk?" Telescope guy: "It's Ecumenical Patriarch Bartholomew!" Gate guy: "Wait until he reaches the gate, then lower it on top of him."